Please note that the content of this book primarily consists of articles available from Wikipedia or other free sources online. 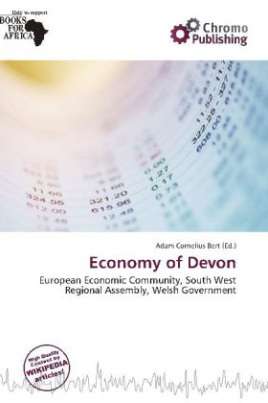 Devon has the 19th largest economy in England out of 46 ceremonial counties. Situated in the region of South West England, it is a maritime county. Like neighbouring Cornwall to the west, Devon is disadvantaged economically compared to other parts of southern England, owing to the decline of a number of core industries, notably fishing, mining and farming. Consequently, most of Devon has qualified for the European Community's Objective 2 status, particularly around Exmoor, Bideford Bay and the Hartland Point peninsula which is somewhat cut off from industrial Britain due to poor road and rail transport links. These areas of North Devon are, however, only around 50 miles by boat from Swansea in Wales. A proposal which has the backing of both the Welsh Assembly Government and the South West Regional Assembly, as well as Devon County Council, is a year-round ferry service from either Ilfracombe or Bideford to Swansea, which it is hoped would stimulate economic growth in both South West Wales and the North coast of Devon and Cornwall.